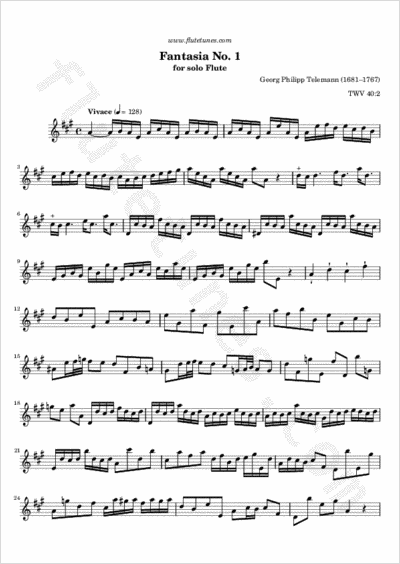 Telemann's first Fantasia for Solo Flute is in the key of A major. Because the piece was designed to be played with no continuo accompaniment, the flute's single line assumes various roles simultaneously, sometimes soaring to a high note before quickly dipping down to provide a closing cadential figure. A prime example can be found in the middle section of the opening Vivace, where Telemann created the illusion of a fugal texture by rapidly sending the flute across registers to intermittently execute quasi-contrapuntal figurations. This piece is also typical in its alternation of slow and fast sections, marked “ad.” and “all.” for “adagio” and “allegro” respectively. The fantasia ends with a binary-form (AABB) passepied in 3/8 time, a lively dance music form that originated in Brittany in the 17th-century. Thanks to Anne for suggesting this piece!